Welcome to the BTE Racing Car of the Week series, where we feature our customers and fans, and the cars (and trucks) they love to race. Today, it's all about Tags Hot Rod Shop and Clark Racing of Brandon, MS. We spoke to Chris Taggart for the information on their three racing vehicles including a Longtop 1967 Chevy II Wagon with a unique paint job. My family has always been in to racing. I remember going to the races with my father Robert Taggart as a small child. My first race at a race track was 1982 at Jackson International Dragway in Pearl, MS.
We have a few race cars at Tags Hot Rod Shop/Clark Racing. My brother Ryan drives the Longtop 1967 Chevy II wagon (pictured). I drive a ’67 Chevy II Hardtop SS, and Ken Clark drives the Candy Brandywine 70 Nova. We all take turns driving "The Black Truck 59 Chevy" that was Super Chevy Magazine’s January 2014 feature. We race that at the Super Chevy show in Memphis every year. 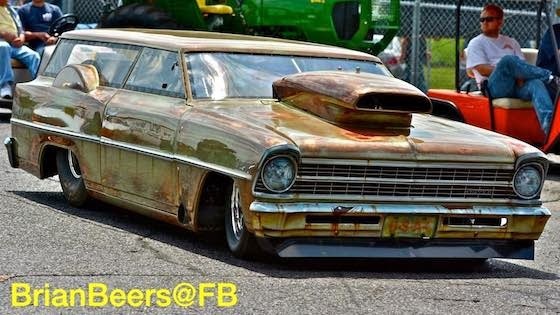 We just call it the Longtop Chevy II or Carbon Fiber and Rust Longtop. The motor parts all look like carbon fiber and the body looks rusty and the car has neither. Pat Musi 14-degree 632 with Gary Williams intake and carbs, two Induction Solutions nitrous oxide foggers. Which BTE products do you use in your vehicles? Larry Larson a Drag Week five time champ and fastest Drag Week car ever! 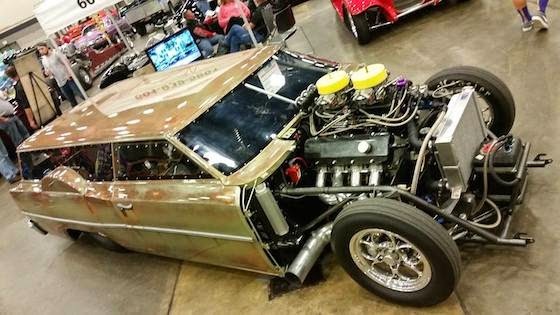 IHRA Pro Stock Mountain Motor! Or a Top Fuel dragster. Dont really have one. I just make it to the track early enough to get decent parking!